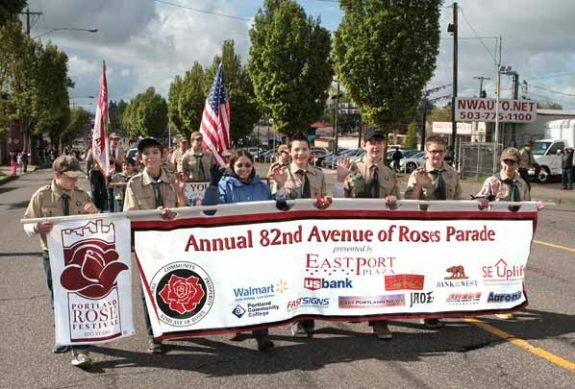 On Tuesday, the Portland Mercury reported that the 11th annual Avenue of Roses parade set to be held this Saturday was canceled after radical leftists announced they were planning to infiltrate and disrupt local Republicans attending the event. From what we could tell, the only real threat came from radical leftists in the area determined to attack what they perceive as “fascists,” i.e., Trump supporters and Republicans. As we noted here, they even used a graphic that suggested killing Trump supporters with bayonets fixed on military-style rifles. James Buchal, chairman of the Multnomah County Republican Party, said his group was ready to clash with the protesters. He said the party had no hand in cancelling the event, and was taken by surprise when they heard the news. After seeing the email last weekend, they had no plans to back out. Organizers pulled out after contacting Portland police, according to Rich Jarvis, spokesman for the Rose Festival Foundation. When police said they couldn’t offer any additional security for the parade, organizers decided to cancel it due to safety concerns.